With growing passenger volumes and pressures for secure identity control at the European Union’s borders, interest is growing in automating and harmonising border control processes. A large research project entitled FastPass and funded by the European Commission is developing solutions for this purpose. Ultimately, however, the funding decisions for the acquisition of automated border control devices and software are taken by national parliaments, making politicians key stakeholders in the process. We examine their subjective views on the socio-ethical, legal, political, and privacy requirements for these systems with the help of Q methodology. In this way we account for the concerns, risks, and opportunities they identify in these systems. 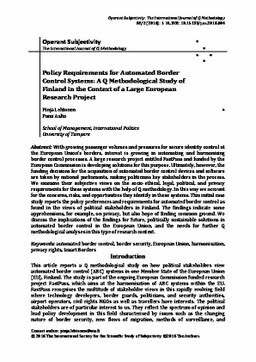 This initial case study reports the policy preferences and requirements for automated border control as found in the views of political stakeholders in Finland. The findings indicate some apprehensions, for example, on privacy, but also hope of finding common ground. We discuss the implications of the findings for future, politically sustainable solutions in automated border control in the European Union, and the needs for further Q methodological analyses in this type of research context.